April 14, 2017 – In March, NOAA’s Geostationary Operational Environmental Satellite-S (GOES-S) satellite was lifted into a thermal vacuum chamber to test its ability to function in the cold void of space in its orbit 22,300 miles above the Earth. The most complicated and challenging test is thermal vacuum where a satellite experiences four cycles of extreme cold to extreme heat in a giant vacuum chamber. To simulate the environment of space, the chamber is cooled to below minus 100 degrees Celsius or minus 148 degrees Fahrenheit and air is pumped out. The test simulates the temperature changes GOES-S will encounter in space, as well as worst case scenarios of whether the instruments can come back to life in case of a shut down that exposes them to even colder temperatures. In this photo from March 8, the GOES-S satellite was lowered into the giant vacuum chamber at Lockheed Martin Space Systems, Denver, Colorado. 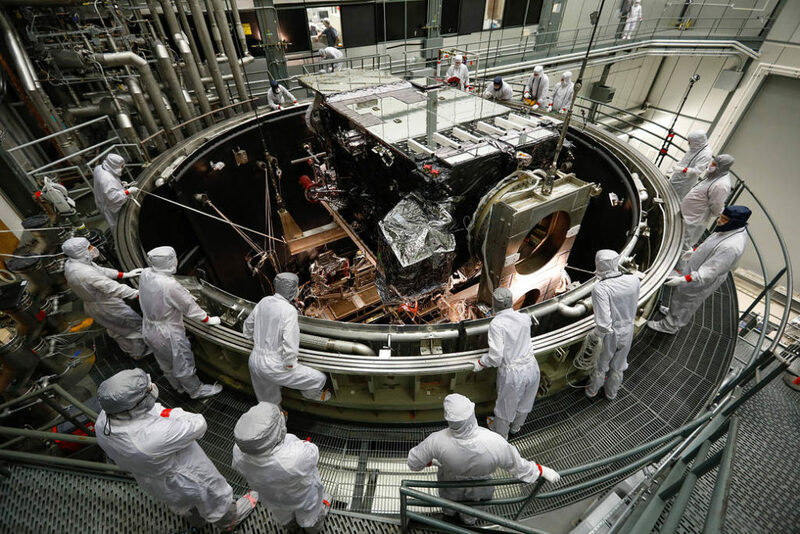 GOES-S will be in the thermal vacuum chamber for 45 days. As of March 30, two of four thermal cycles were complete. GOES-S is the second in the GOES-R series. The GOES-R program is a collaborative development and acquisition effort between the National Oceanic and Atmospheric Administration and NASA. The GOES-R series of satellites will help meteorologists observe and predict local weather events, including thunderstorms, tornadoes, fog, flash floods, and other severe weather. In addition, GOES-R will monitor hazards such as aerosols, dust storms, volcanic eruptions, and forest fires and will also be used for space weather, oceanography, climate monitoring, in-situ data collection, and for search and rescue.